Monazite: A rare-earth phosphate mineral. A rare phosphate mineral mined from placer deposits for its rare earth and thorium content. 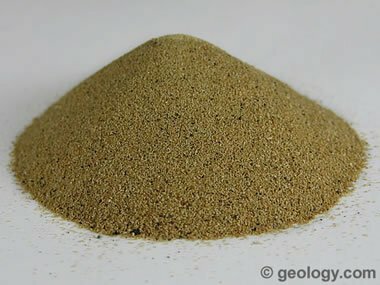 Monazite sand: Monazite sand with a resinous luster from Malaysia. Monazite is produced from heavy-mineral concentrates and then separated out by specific gravity, magnetic processes, and other processes. Specimens are sand-grain size particles. Monazite is a rare phosphate mineral with a chemical composition of (Ce,La,Nd,Th)(PO4,SiO4). It usually occurs in small isolated grains, as an accessory mineral in igneous and metamorphic rocks such as granite, pegmatite, schist, and gneiss. These grains are resistant to weathering and become concentrated in soils and sediments downslope from the host rock. When in high enough concentrations, they are mined for their rare earth and thorium content. Monazite crystal: An exceptionally large monazite crystal, approximately two inches across, collected in Brazil. Specimen and photo by Arkenstone / www.iRocks.com. Uses An important source of thorium, cerium, and other rare elements. 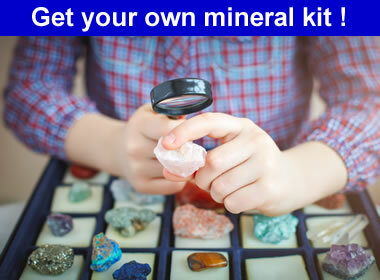 Often mined as a byproduct from heavy mineral deposits. A Mineral or a Mineral Group? The generic chemical formula for monazite, (Ce,La,Nd,Th)(PO4,SiO4), reveals that cerium, lanthanum, neodymium, and thorium can substitute for one another in the mineral's structure; and, substitution of silica for phosphate also occurs. Monazite is part of several solid-solution series with other minerals. "Monazite" is also the name of a group of monoclinic phosphate and arsenate minerals that share traits of composition and crystal structure. A list of minerals in the monazite group is provided below. Note that several varieties of monazite are included. Monazite is a yellowish brown to reddish brown or greenish brown mineral with a resinous to vitreous luster. It is translucent and rarely seen in large grains or as well-formed crystals. Granular masses are sometimes seen where monazite is locally abundant. It breaks with good to distinct cleavage. Its hardness ranges from 5 to 5.5. It has an unusually high specific gravity that ranges from 4.6 to 5.4 depending upon its composition. Monazite and quartz crystals: Orange-pink twinned crystals of monazite-(Ce), about 5 millimeters in length, with quartz from Bolivia. Specimen and photo by Arkenstone / www.iRocks.com. Monazite is known more for where it accumulates instead of where it forms. It forms during the crystallization of igneous rocks and during the metamorphism of clastic sedimentary rocks. 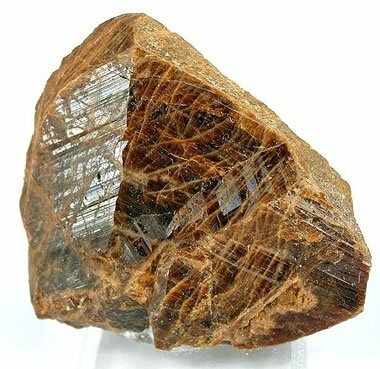 When these rocks weather, monazite is one of the more resistant minerals and becomes concentrated in the weathering debris. The soils and sediments found near a weathering outcrop can have a higher concentration of monazite than the source rock. The liberated grains of monazite then begin a journey downslope. Eventually they are brought to a stream or a dry wash. There, the actions of gravity and running water help the heavy grains of monazite and other heavy minerals segregate from lighter minerals. They accumulate behind boulders, on the inside bends of stream channels and work their way down into the lower portions of the sediment deposit. Some are washed to the sea where they accumulate in deltaic, beach, or shallow water sediments. 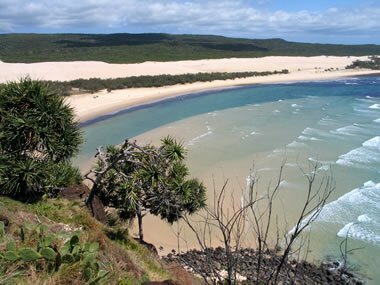 Monazite sands at Frasier Island, Australia: Australia was once the world's largest producer of monazite and is thought to have the world's largest monazite resource. However, Australia has not produced significant quantities of monazite since public objection shut down mining at Frasier Island, Queensland. All monazite mining is focused on placer deposits because they are easier to mine and the monazite is often present in higher concentrations than in hard rock deposits. 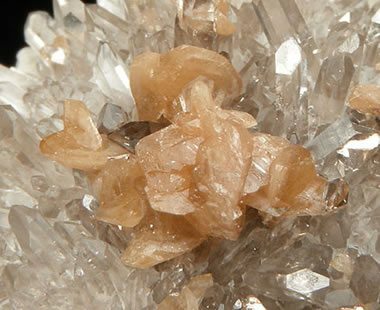 Other heavy minerals that accumulate with monazite include gold, platinum, magnetite, ilmenite, rutile, zircon, and a variety of gemstones. The heavy sands recovered are processed to separate these heavy minerals, and the light fraction is returned to the deposit. Stream sediments, alluvial terraces, beach sediments, beach terraces, and shallow water sediments have all been dredged for heavy minerals. Today, most of the world's monazite is produced in the offshore waters of India, Malaysia, Vietnam, and Brazil. Southern India and Sri Lanka have the most extensive offshore monazite resources known. Australia was once the world's largest producer of monazite and is thought to have the world's largest monazite resource. It has not been a significant producer since the 1990s, after public objection shut down mining on Frasier Island. Monazite is not currently mined in the United States. In the past it was mined from stream placer deposits in Idaho. These deposits formed from weathering of the Idaho batholith. Monazite has also been mined as a byproduct from offshore deposits along the southeast coast of the United States, from North Carolina to Florida. Inland and offshore deposits are known to exist in many states, but they are small, low-grade deposits when compared to what is currently mined in other countries.